Whenever you think of Poonam Dhillon, you are reminded of the innocent beautiful girl with a lovely smile, the lead actress of Noorie, one of the biggest blockbusters of its time. But, not many of us would be aware that this pretty damsel is an avid dog lover as well. Poonam Dhillon – the Gapoochi Gapoochi Gum Gum girl, instantly won the hearts of millions of Indian cinegoers and still today she manages to steal the show with grace. A naïve lasso of all 16, she was crowned with Miss India title in 1979…and as they say, rest is the history. Her successful stint with bollywood continued till late 80s… and some of her memorable flicks were Noorie, Sohni Mahiwal (1984), Saveray Wali Gaadi (1986) and Naam (1986). She’s a successful business woman as well. She pioneered the concept of make-up van in Indian tinsel town. Her company “VANITY” is reaping good moolah. She also launched her own website in 2000 and is actively involved with the social causes like drug awareness, AIDS awareness, family planning, organ donation, etc. Like most of the newage woman, she is also enjoying the best of both the worlds’…be it professional or personal. Well! 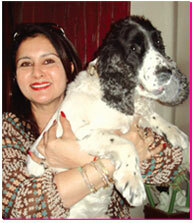 She is blessed with two lovely children – Anmol and Paloma – and one pet kid – Pepper. And she very much enjoys the company of her teenage pals and furry friends. 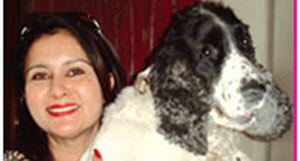 Infact, Poonam has always shared her life with pets, especially dogs. “Till now, I have shared my life with four dogs and all of them were very special. But, I would like to mention one cutie named “Gypsy” who was a mix breed of Dachshund & Tibetian Spaniel, which made him small yet not bald like a sausage but furry with adorable gorgeous eyes! My current pet “Pepper” is not a pet but like a third child of the family and so is referred to as – my son,” tells Poonam with a twinkle in her eyes. “I love his calm and affectionate nature, not to forget his lovely face and loving eyes, ” shares Poonam. We bet nobody can forget Poonam’s lovely smile as well! “All the stuff my daughter does with him…very noisy but fun,” tells the proud mom. “Greed…staring longingly at whoever is eating…” she adds with a laugh. “Even though my house help is well tuned to his needs, but I and my daughter take care that Pepper is fed a well-balanced diet and is well exercised as well,” tells Poonam. That’s like a responsible pet parent, we are proud of you Poonam! “He is an ‘EAT ANYTHING YOU EAT’ dog. His favourite dishes list is endless… chicken, biscuits, dosa, butter toast, burgers, pizza, apples, cucumbers…you name it and he likes it,” tells Poonam laughingly. “Treat him as you would treat your child because when we take him/her away from his/her own mum…we do take on that role,” concludes Poonam. Very right Poonam, dog lovers would defi nitely agree!